One of the challenging things in life is when we start to get older and family or close friends start to receive diagnosis of their health. Yes, I’m talking cancer in the family. It’s one of the most challenging things one goes through when loved ones start to show symptoms, go through treatment with drastic side effects and with the looming query of: what’s going to happen next? The overwhelming sense that one can’t really do much, the underwhelm of not being able to do much except comfort the person which is really hard to do when we’re rundown, exhausted, worried and busy with normal life. So what can we do apart from cook dinners? maintaining good sleep wherever possible. Sleep is necessary for the body to replenish stores and do minor repairs around the body from the day. Maintaining a balance of hormones. Why is this so important? Hormones are the bodies messengers to tell parts of the body to do things. Yes, reproduction is a result from hormones but they also have a great effect on keeping us calm, awake, good focus, active with energy and even sleep when it’s bed time. If one is over used then it’s eventually like a game of domino’s, but not quite as fun. Maintaining good energy means everything becomes easier! Doom and gloom isn’t an overbearing sense but more a sense of acceptance and you are more likely to make more good moments. Having good energy means eating good food and often. Food is our fuel therefore there is some truth to “You are what you eat”. Good energy means having enough energy to make breakfast lunch and dinner for yourself and whoever else you need to. When we’re busy, stressed and overwhelmed one of the first things to go out the window is dinner and/or breakfast. This is effectively not putting good fuel in the engine and expecting it to do a Formula 1 race every day. The maths just doesn’t add up, does it? Preparing good nutritious food is paramount and may take a bit of organising but should be a priority on your to-do list. Taking care of any aches, pains and health issues of your own so when you’re with your loved one you can be as present and focussed with them as possible. So we’ve talked benefits, now the big question is: how? I’m a Naturopath and Kinesiologist so I’m going to say naturopathy and kinesiology works wonders! So I will go through some benefits however if your thing is massage do that. And do it regularly! I love naturopathy as essentially it’s utilising herbs, nutrients, food as medicine, flower essences and even appropriate homeopathics to support and maintain wellbeing. For example often stress and energy are big ones that need support as they can unwind everything else. There are some fantastic herbs called adaptogens that help support energy levels whilst calming the nerves. Herbs can cater specifically for your personal health requirements whether it be stress, energy, pain and inflammation or digestion. They can make day to day life easier! Massage – If you have aches and pains and respond well to massage book one in regularly. A one off is nice, but an ongoing weekly or fortnightly massage works wonders for stress and energy management long term. Reflexology – via pressure points on the feet this modality also works on rebalancing energy systems (and organs). Plus you get to lie down for one hour and totally relax into an amazing foot rub! Chi Nei Tsang – this is a particular massage style for your belly. It is really good for digestion as when we are stressed, busy and tired our digestion often takes the brunt of it all and starts to not work as well. And what does digestion do? It processes our fuel (i.e. food) so we can use it efficiently. Therefore digestion is really important. Some people like to mix it up, that is naturopathy/kinesiology every three weeks to keep on top of things and in between a massage, reflexology or chi nei tsang. It’s whatever works for you! 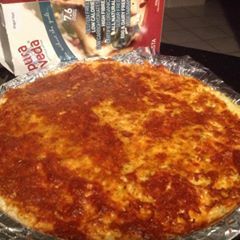 Here’s a low-carb pizza made with angelhair noodles..
(available at New Leaf) yummy!! 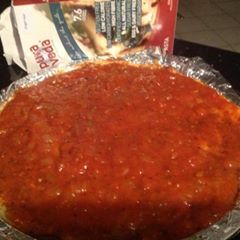 5. spread warmed sauce (marinara) over the top of the pizza and enjoy!! Acid forming foods – this is not as simple as it seems. Proteins cause acid residue, so many acid/alkaline diets eliminate proteins. Fats create fatty acids, anything that turns into sugar (carbohydrates) will make the body more acidic if we’re not utilising the sugar through exercise and metabolism, any foods that we are intolerant to, or have allergies to cause our immune system to release eosinophils (white blood cells) that release acids into the blood stream. Even fruits in small amounts are alkalising, but in large amounts are acid forming. Alcohol, tea, coffee, soft drinks and fruit juices are all acid forming. So what’s alkalising? Green leafy veggies (assuming we’re not allergic to them), purified water (most town water supplies are acidic). There are many fantastic supplements that support an acidic constitution such as G-Tox & Calm-X. There are many foods considered ‘healthy’ that our bodies can be having issues with, creating inflammatory immune responses, without us even knowing. Our responses simply may be tiredness, bloating, constipation, any type of pain or diarrhoea. Our food detective quickly checks around 50 core food groups (within an hour consultation) for intolerances. Kinesiology can further muscle test core acupuncture points know to be hot-spots for immunity, therefore finding out if the body has issues with foods/substances in foods. When we have allergies, we have increased levels of eosinophils in the blood, which spray acid on the undigested food particles, thereby making the bloodstream more acidic. Immune Dysregulation (anything that causes the immune system to be overloaded, or overwork, or underwork. We find signs of these 3 causes of disease in our OligoScan, Looking at your blood in real time, VLA BioImpedance & Cholesterol Check: Ask about our testing packages which give you this information so that you can work on your health! Choosing foods which increase glucagon (the fat-burning hormone) and decrease insulin (the fat-storing hormone) and reducing meal size is crucial for weight loss and maintaining our muscle mass. We do several dietary options for weight loss: HCG Weight Loss; Shake It Programme; Keto Programme and by helping people choose general good choices. The process of eating is a necessary inflammatory process. It’s made even worse if we have digestive issues, chronic health problems or are on medication. There are always studies showing that this food causes this, or that food heals that… but studies with food are often flawed and we have more heart disease, diabetes and chronic ill-health than ever before. An example of a great combination of food to consume would be, per meal would be: 1 handful of protein, 2-3 cupful’s of vegetables, good fats (a small handful). A high protein/good fats breakfast (as opposed to toast or cereal) may include eggs/tomatoes/spinach; or protein shake with berries/nuts. Insulin/Glucagon Ratio to keep in mind. Eating carbohydrates releases insulin. Insulin is a necessary hormone which helps us to make energy out of sugars in our diet – it’s released with all carbohydrates. If, however, we are insulin resistant, or have too much insulin, it is inflammatory, acid forming, damaging to the capillaries and raises total cholesterol levels (cholesterol is a protective hormone which protects and heals the capillaries from insulin which has created damage) and causes heart disease, diabetes and may be linked with chronic fatigue and cancer..
Carbohydrate foods (breads, cereals, fruits, potato, corn, carrots, peas, sweets, baked goods, sugar, soft-drinks, beers, sparkly wines etc) are the number one reason for weight gain, fatty liver and diabetes. Carbohydrates release insulin which is an inflammatory fat-storing hormone when out of balance! If you are insulin resistant, carbohydrates are not your friend until you get it under control – ask us about our insulin resistant test. The best choices for carbohydrates are organic berries, low carb fruits, low GI vegetables. Most health issues will benefit from a low carbohydrate diet. Avoid white flour, white sugar, white rice, starchy potatoes. We require healthy small intestines and pancreas to break down and digest carbohydrates. Cocoa and cacao are unusually rich in flavanols that help preserve the function of blood vessels. Maintaining youthful blood vessels lowers risk of high blood pressure, type 2 diabetes, kidney disease and dementia. The problem with chocolate, of course, is the amount of sugar we have with it. Sugar is inflammatory. High cocoa, low sugar is the key. We’re not talking about Cadbury chocolate here! A single cup of good quality, organic coffee daily seems to have many health benefits. Decaf doesn’t seem to have the same benefits. Even white tea and black teas have some health benefits. Once we add the sugar it becomes less beneficial. Green tea has many health benefits including improved fat-loss and fat-metabolism and reducing insulin resistance. Buy organic herbal teas, tea and coffee – these are drinks with huge amounts of pesticides used. Too much black tea/coffee is linked with adrenal fatigue. Your dairy products may contain growth hormones, since up to 1/5th of dairy cows utilise these hormones. If you must drink milk, buy organic. Some people have issues with lactose (dairy sugar), and it’s easy to get Zymil which is a lactose-free milk. Some people have issues with casein (the milk protein) and often find A2 milk beneficial. We need good stomach, small intestines, pancreas and liver function to break down and uttilise dairy as well as healthy DPP4 enzyme levels. soy milk – buy organic; GMO soy is definitely not healthy. Eggs do NOT raise cholesterol. Organic/free range eggs should be eaten freely as part of a healthy diet – assuming there’s no allergy. They are high in good fats and protein and help to reverse insulin resistance. Fats are not the bad guys they’ve been made out to be over the past 40 years. Most disease is linked to inflammation, free-radical damage and immune dysregulation. Fats (and protein) release glucagon, which is a fat-burning hormone. Conversely, carbohydrates (sugars) release insulin which is inflammatory and fat-storing. Trans-fats and hydrogenated fats are cancer forming and should be avoided. These are in packaged foods and long-life foods containing oils and deep-fried foods. For healthy fat metabolism our liver and gall bladder (and subsequently the small intestine) need to be functioning. Once the gall bladder is removed, fat metabolism will never be optimal again. Healthy fish is an abundant source of omega-3 fatty acids which help prevent heart disease and protect against abnormal heart rhythms. Fish is also high in protein, low in saturated fat, high in unsaturated fat. Tuna, salmon & sardines are high in EPA which preserves collagen, DHA prevents skin cancer by reducing inflammation, and EPA and DHA both are good for the heart and brain. EPA (in therapeutic levels) is also anti-inflammatory and DHA is for heart disease, eyes and brain. Where possible ensure you’re not buying ‘farmed fish’ as these are vaccinated and given anti-biotics. Fresh fruits: eat a rainbow! Always keep limes or lemons -use to make fresh lime/ hot water in the morning and to have with avocado/ salad or with papaya. Compounds in blueberries (and other berries) mitigate inflammation and oxidative damage, which are associated with age-related deficits in memory and motor function. Studies have shown cherries help reduce the frequency of gout attacks. Research has shown that the anthocyanins found in cherries have an anti-inflammatory effect. Anthocyanins can also be found in other red and purple fruits like strawberries, raspberries, blueberries and blackberries. Organic strawberries are high in vitamin C and protect our genes from damage. Studies show that Sensha Green Tea improves levels of catecholamine’s such as adrenaline and dopamine – and increases fat metabolism. Drink good quality green tea – organic – often! If you want to lose weight J . Studies show those who drank good quality green tea (or equivalent supplement such as Thermoburn) has up to 20% extra ‘fat’ in their stools, indicating better fat metabolism and less fat absorption. Green tea also helps reverse insulin resistance. Buy organic and good quality to avoid toxins. Seems like a no-brainer – healthy sugar. BUT it’s still sugar to be taken into account with our carbohydrate load throughout the day. Did you know most honey now contains anti-biotics? It’s seems ridiculous, but buy organic honey, not genetically modified, full of anti-biotic honey. Soak legumes overnight, use fresh cooking water and cook well, add a couple of strips of dried seaweed in the cooking water to improve digestibility and mineral content of the dish. Organic canned legumes are also an option. Legumes and pulses are considered ‘high protein foods’ for vegans and vegetarians – they are still predominantly carbohydrates – so be careful with weight gain – especially through the mid-section as they can be difficult to digest. Assuming we’re not intolerant or allergic, nuts are a great addition to the diet (not salted and raw!) – calorie and number we eat – take care!. Peanuts have a huge amount of evidence in reducing heart disease, nuts are a rich source of unsaturated fats, with similar benefits to olive oil. They’re also concentrated sources of vitamins, minerals and other phytochemicals, including anti-oxidants. Studies show that people who eats nuts live on average 2.5 years longer. For cooking – cold pressed coconut oil, Tea (camellia) oil, rice bran or cold pressed sesame oil. Most foods should be baked, steamed, poached or boiled, not cooked with oil. Store oils in a cool, dark place, do not transport in the heat or leave in the sun, or anywhere hot. Avoid margarine. A small amount of good quality butter is ok. Extra Virgin Cold-Pressed Olive Oil contains polyphenols, powerful anti-oxidants that are linked to low rates of heart disease and cancer and may help prevent age-related diseases. About 50ml daily recommended. Avocado & Walnut oils are also high in omega 3’s. if you eat organ meats, such as liver, they should ALWAYS be organic, as they accumulate toxins easily. We all know that red wine is ‘good for us’. There is more resveratrol in Pinot Noir (10 x more than other red wines) and resveratrol protects our genes and slow cellular aging. Also protects against heart disease, diabetes and age-related memory loss. White wine also has some anti-oxidant effects, but less than red wine. Sweet wines have less benefit. More than 250mls of alcohol daily becomes inflammatory. In looking at your blood on the screen, we see that alcohol in general causes leaky gut, immune dysregulation and oxidative stress when out of balance in the diet. Organic soy is rich is isoflavones – great for skin and preventing collagen breakdown. Also organic soy is high in protein, fibre and low in fat, high in anti-oxidants. There are soy protein powders if soy products don’t excite you. Tomatoes: anti-aging! Contain lycopene (only released during cooking tomatoes) which is a carotenoid – known to reduce inflammation and oxidative stress. Place in a bowl seeded mustard, curry powder or chopped fresh herbs + chopped garlic and cracked pepper. Add 2 tablespoons quality vinegar: apple cider, red wine vinegar, balsamic or similar, and blend with a fork. Add 6 tablespoons cold pressed, organic olive oil and whisk together. This should make more than enough dressing for a salad or dish of steamed vegetables. Leftover dressing can be stored in the fridge. Natural organic sugar-free yoghurt may have health benefits due to the beneficial bacteria. When sugar is added, or using non-organic dairy, it may be as beneficial as eating ice-cream!! Many of the yoghurts designed for children have no health benefits whatsoever. So many ‘healthy food snacks’ – cheese & crackers, muesli bars, fruit juices, peanut paste, yoghurts – have many additives and preservatives. These are hard for the body to recognise and eliminate. They are hormone disruptors – affecting moods and wellbeing in sensitive individuals. Studies show that many children ‘eat’ over 100 additives per day. Aware parents can often reduce this to 40-60. Being really diligent (no plastics, organic foods, all farm-fresh, organic milk) – we can get it to under 10. It’s challenging as there’s no regulation on our foods. Aspartame is a toxic additive used in numerous food products and should be avoided for numerous reasons, including the fact that it is created with genetically modified bacteria. Not a healthy snack. These are deep-fried banana chips. Lots of calories. Heaps of saturated fats. One of the most chemically altered foods, is obtained from rapeseed through a series of chemical actions. It’s a time honoured tradition – cereal, muesli, oats or toast for breakfast. Yet our energy is getting lower, we’re getting fatter and more inflamed and we don’t have the energy to live life to the full. Starting the day with cereals and toast is starting the day with a high carb breakfast (yes, even oats) – our body then has to utilise the sugar it turns into before we will burn any fat. Some people will get away with this, others won’t. Non-organic Chicken – bugs galore! Organic chicken is worth the money. Why? What we eat affects our immunity, our gut, our health. Animals which have been vaccinated and given anti-biotics for much of their lives are basically breeding grounds for super-bugs. Caged and non-organic chickens (and their eggs) often are infected with e-coli and salmonella, since these bacteria thrive in an anti-biotic-laden system. Linked with numerous health issues including weight gain and organ disruption. Around 50% of corn is GMO. The Bt toxin being used in GMO corn, was recently detected in the blood of pregnant women and their babies. Cotton Oil originating in India and China have serious risks. Share the same problems as trail mixes. Very high in sugar, with chemicals added which are designed to prevent the fruits from oxidising. Have you noticed bananas or apples going brown once you cut into them? This is oxidation. A normal process which doesn’t happen with dried fruits. Most of the nutritional value has gone once they’re dried and boiled – and with the addition of sulphur dioxide and high sugar levels – not a healthy snack! Polyols (eg xylitol, mannitol), : Apples, Apricots, Avocado, Cherries, Nectarines, Pears, Plums, Prunes, Mushrooms, sorbitol (420), mannitol (421), xylitol (967), maltitol (965) and isomalt (953). Fructans: (Artichokes (Globe), Artichokes(Jerusalem), Garlic (in large amounts), Leek, Onion (brown, white, Spanish, onion powder), Spring Onion (white part), Shallots, Wheat (in large amounts), Rye (in large amounts), Barley (in large amounts), Inulin, Fructo-oligosaccharides. Juice gives us heaps of energy – but it’s because of the sugar. Fruit juices age the cells 7 x faster. When we drink fruit juices we have plenty of fructose in our system –fructose is the number cause of non-alcoholic fatty liver disease. It’s almost impossible to avoid GMO foods, but limiting what we can is a good idea. GMO foods have pesticides, herbicides and anti-biotics within the foods themselves – they can’t be washed off. This changes the way our body responds to these foods and may create allergies and intolerances, or simply overwhelm the immune system and digestive tract. After world war 1, 2 strains of gluten were genetically modified to create a new super-grain with 2.5 x more gluten. Health problems started. 30% of Aussies have the ‘celiac gene’. Only a genetic test showing you don’t have a celiac gene means you’ll never get celiac disease. Regardless, everyone who eats GMO wheat gets leaky gut within 15 minutes, GMO wheat creates inflammation, ramps up immune responses, causes cell death on its way through the digestive tract. It then comes down to what we eat with the gluten and our nutritional status, as to how quickly we heal after eating. Imagine however, a daily inflammatory response to gluten, meal after meal after meal. If you must eat wheat – eat organic. Treat wheat like sugar – not several times per day. Prottect your gut. Depending on our health goals, eating low fat foods can be very unhealthy. Keeping in mind our insulin/glucagon ratio we’re aiming for, per meal, eating low fat is actually putting us into a fat-storing metabolism. Take milk as an example. Organic full cream milk has 8.8g protein, 8.8g fat, 15.8g carbs (from lactose) – the ratio is about right 50/50 protein + fat = carbs. Take out the fat, and now there’s nearly twice the carbs – which puts the food into a fat-storing, insulin increasing inflammatory food group. This may be a surprise but GMO paw paws have been grown in Hawaii since 1999. Europe refuses to accept them. Buy local or grow your own. Beware the dressings which can contain more sugar than the salad itself – and what’s the point of eating a salad if it has more calories than a burger and more sugar than a coke? Contain many additives and preservatives which aren’t healthy, not to mention the huge amount of salts, which will cause fluid retention and possibly hypertension if other minerals are deficient. Eat in moderation if you can’t avoid. Found in tofu, vegetarian products, soybean oil & flour, soy is modified to resist herbicides. Around 90% of Soy is currently genetically modified to resist Roundup. Massive amounts of Glyphosate is sprayed on soybeans. Non-GMO soy is much more healthy than GMO, which has huge negative health impact. In the U.S. GMO Sugar beets have been introduced since 2009. Sugar in general (regardless of the source) is inflammatory, acid forming, increases risk of cancer, heart disease, diabetes, immune dysregulation. Sugar is 50/50 sucrose and fructose. Fructose is the number 1 known cause of non-alcoholic fatty liver disease. Eliminating sugar in your diet can be life-changing. Very convenient, cost-effective, lightweight and compact. Great snack BUT high in calories, especially with chocolate and extra nuts. The raisins are often candy coated make them sweeter. A small serving is up to 600 calories, with refined carbohydrates and trans fats in the package. contain 600 calories. If you love them, go sugar free, and take into account the calories involved. Read the labels! Closely related, these two squash varieties are modified to resist viruses. Farm fresh/organic where possible. Pesticides/Herbicides – avoid where possible & wash wash wash! Salicylates are substances in foods that are naturally occurring ‘aspirin-like’, that also has natural pesticide actions. Therefore, they thin the blood and many allergic symptoms are linked. If out of balance, they can cause tummy upsets, blood noses, leaky gut and ulcerations. Other symptoms are BP issues, kidney & liver upsets, rashes, asthma, tinnitus, central nervous system effects, behavioural issues, incontinence and hypoglycaemia. Reducing salicylates is about increasing filtered water, eating organically grown, vine and naturally ripened foods, eating a wide variety of healthy veggies & proteins. As soon as soft drink’s swallowed, the pancreas is notified and rapidly begins to create insulin in response to the sugar. Insulin is a hormone the body uses to move sugar from food or drink into the bloodstream, where cells are then able to use sugar for energy. Within just 20 minutes, blood sugar levels spike and the liver responds to the insulin by turning sugar into fat for storage. Within 45 minutes of gulping down a glass, caffeine from the drink is fully absorbed, and as a result your pupils dilate and blood pressure rises. The body produces more dopamine, which stimulates the pleasure centres of the brain — just like a low-grade line of cocaine. You are currently browsing the archives for the Healthy Eating category.